Free Horse Racing Tips, Click Here! Fingers are firmly crossed that the Jonjo O'Neill-trained Synchronised will come through his final gallop and be allowed to travel to Ireland for a rematch with local star Quito de La Roque in the eagerly anticipated Irish Hennessey Gold Cup, a key trial for the Cheltenham Gold Cup less than five weeks later, writes Elliot Slater. O'Neill hasn't yet decided whether or not to let his Lexus Chase winner travel back to Ireland for the Hennessey where he would be pitched in against Quito de La Roque for the second time in as many outings, having beaten Colm Murphy's charge by eleven-lengths into third place when the pair met over the course and distance in late-December. Synchronised's Lexus Chase win came as a surprise to many observers who had previously only considered the former Welsh and Midlands Grand National winner a smart staying handicapper, but the JP McManus-owned gelding proved more than up to the task as he romped to a comfortable success first Grade 1 success under champion jockey Tony McCoy. 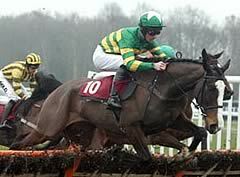 Those following the latest Cheltenham Gold Cup betting online will be keeping a close eye on his future endeavours. 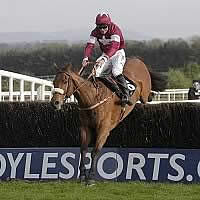 Should O'Neill choose to avoid another trip across the Irish Sea then Quito de La Roque, a Grade 1 winner last term and this season when he beat Sizing Europe to land the JNwine.com Chase at Down Royal in November, would likely start a warm order for the race despite the possibility of last season's high-class pair of RSA Chase winner Bostons Angel and runner-up Jessies Dream also being possible contenders for the coveted Hennessey prize. Bookmakers currently make Synchronised a marginal 3/1 favourite ahead of Quito De La Roque at 7/2, while Jessies Dream is an 8/1 chance and Bostons Angel is available at up to 12/1 for the February 12 contest. In the Cheltenham Gold Cup market Synchronised is a popular each-way choice at 12/1, Jessies Dream and Quito De La Roque can both be backed at around 25/1 and Bostons Angel is a 40/1 chance.